It's almost spring/summer, so it's time to take out the season's staples fabric, gingham. While gingham can be hard to pull off, it can be done and this collection gives you an idea. Step into the gingham trend with inspiration from this look. 1. 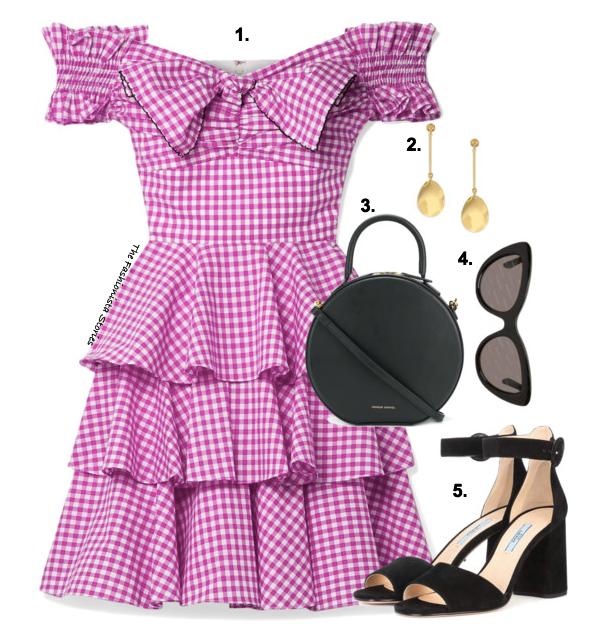 CAROINE CONSTAS 'Helena' off-the-shoulder gingham dress, NET-A-PORTER. 2. KATE SPADE NEW YORK golf standard linear drop earrings, SAKS FIFTH AVENUE. 3. MANSUR GAVRIEL mini round tote, available at FARFETCH. 4. BALENCIAGA black logo mania cat-eye sunglasses, available at BERGDORF GOODMAN. 5. PRADA black suede sandals, available at FARFETCH.